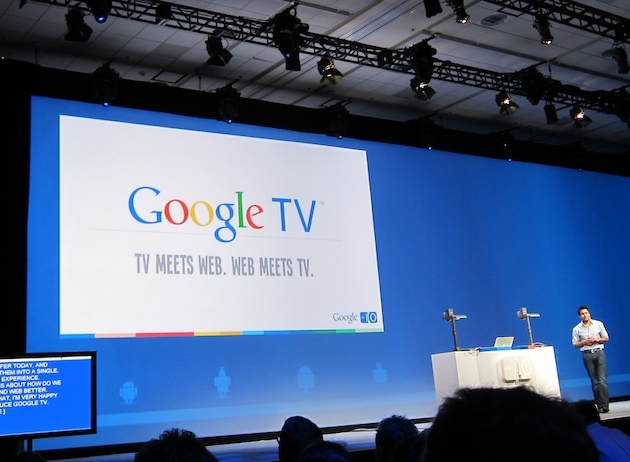 Today at Google I/O, the company made the announcement that everyone was waiting for — Google TV. While some glitches in the demo (with the Bluetooth keyboard) prevented it from being a “wow” moment, the implications are pretty clear what Google is going for. That is, the 4 billion TV users worldwide. Or rather, advertising to the 4 billion TV users worldwide. Google noted that while computer usage is huge with 1 billion users, and mobile is even bigger with 2 billion users, TV is the real massive medium with 4 billion users around the world. Further, Google notes that people spend 5 hours a day on average in the U.S. watching TV — and that’s more than ever before. Then the real stat came out. 70 billion dollars. that’s the annual ad spend on television in U.S. alone. 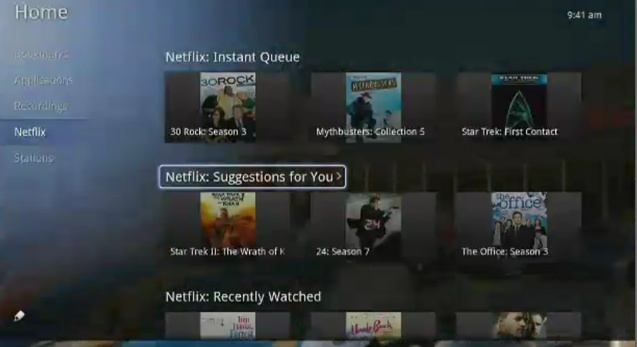 You can also use the Android devices to speak to your TV — voice search on the TV. 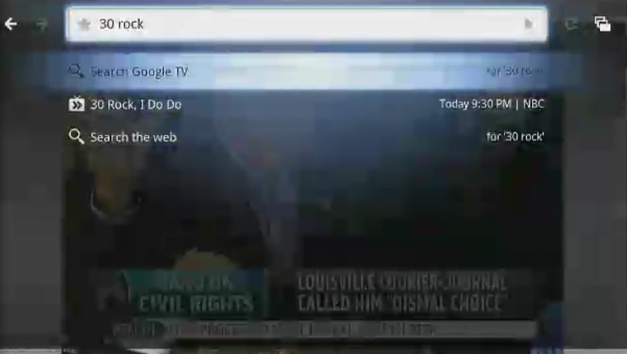 Google TV is built on Android (2.1 right now, but they’ll upgrade it later). It runs Google Chrome for the browser. And yes, it has Flash (10.1). Also cool, since Google TV is Android-powered, Android apps will work on the TV. With the device, there will be two app frameworks: web apps and Android apps. 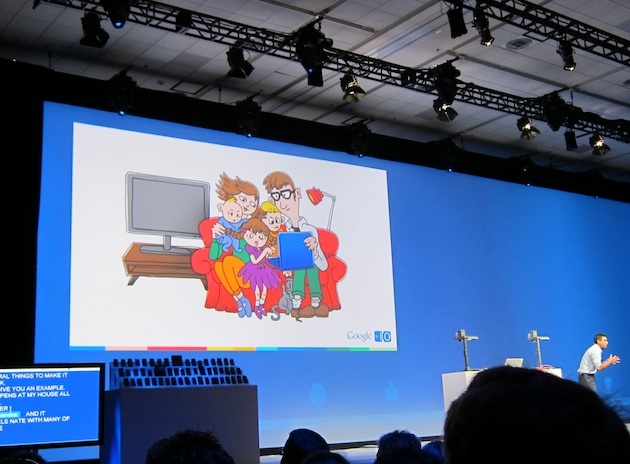 A new SDK for the Google TV is coming as well. And YouTube has a new product they’re launching for Google TV: YouTube Leanback — this is an optimized way to use YouTube on a big screen. Google TV will be open sourced in both the Android and Chrome source trees. Google has partnered with multiple device makers to bring the product to market. There will be three Google TV devices. Sony will have TVs and Blu-ray players with Google TV built in. Logitech will have a companion box. Intel will be powering all the devices with the Atom processor. Google has also partnered with Dish Network — there will be an enhanced Google TV experience with it. And they have a retail partnership with Best Buy. These will all launch in Fall 2010. But the platform won’t launch for developers until 2011. 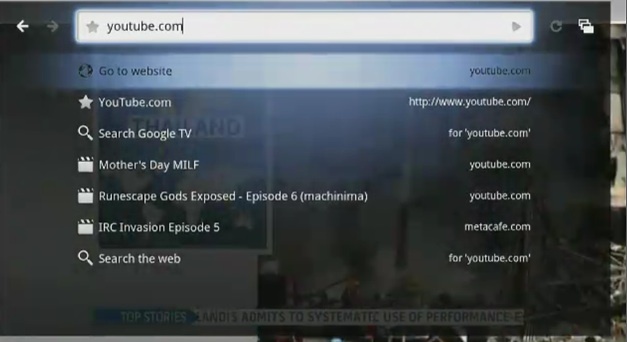 As a bonus, as Google showed during its demo, Google TV is one hell of a way to search for “MILFs” from your couch (see pic below).